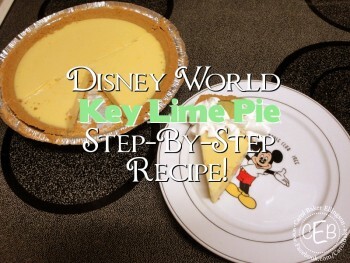 DFB guest chef Carol E. returns today with a traditional recipe for the Key Lime Pie from Olivia’s Café at Disney’s Old Key West Resort. Get your baking supplies ready! Being a Florida native (Yes, native!! I was one of about 7 people actually born here…everyone else is a transplant. Ha! ), I was excited to dive into this recipe! Even better, you can get our official state pie at Walt Disney World — and this is one of the best versions of it on property! 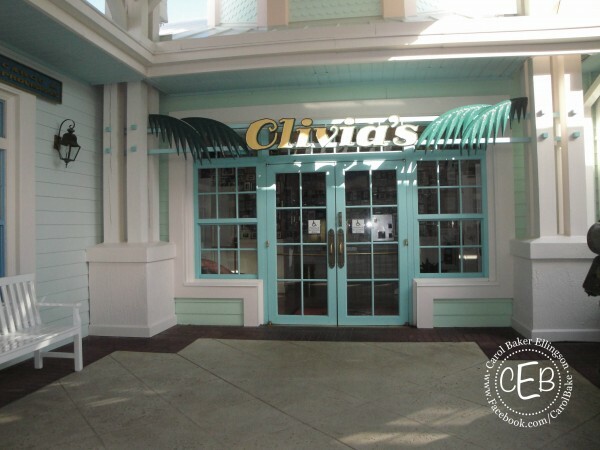 This Florida tradition is served perfectly chilled every day at Olivia’s Café! 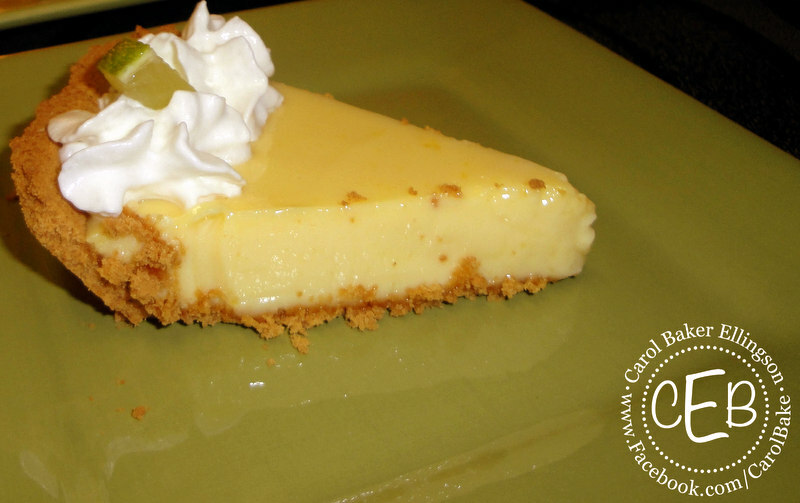 While there are a lot of different recipes for Key lime pie, the traditional one is the best! It only takes three ingredients to make the pie filling. 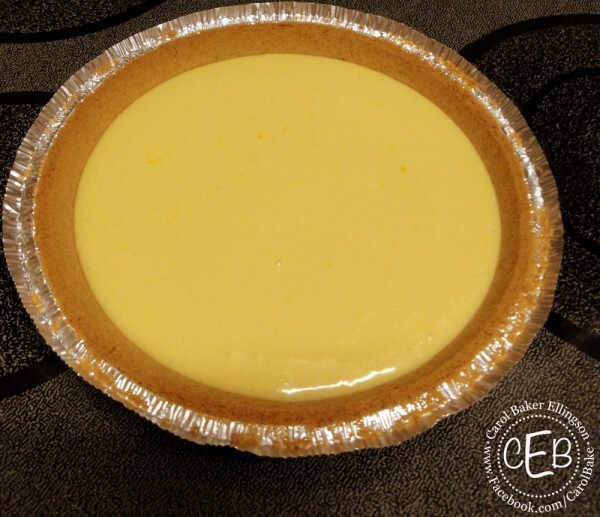 If you make it right, it will be pale yellow in color and it will have the perfect balance of creamy sweet and tart goodness. Key Lime Pie at Olivia's Cafe. I was excited to find the traditional Key lime pie recipe from Olivia’s Café in the Cooking with Mickey and the Disney Chefs cookbook to share with you! While Olivia’s Café has taken the pie to the gourmet side now by making it in an individual “tart” style and adding a meringue topping with dollops of raspberry and mango purees, we’ll be sticking to their original recipe from the cookbook — topped off with whipped cream. So let’s get baking! But before we get started, I do want to warn you that this is a plan ahead recipe. You need at least 3-4 hours in the fridge, but better if left in overnight before serving! It’s actually a super quick and easy recipe to make. 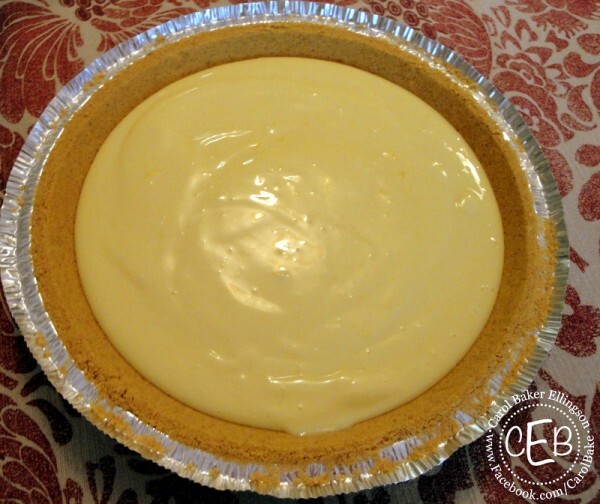 It will take you more time to cool and chill the pie than it will to actually make it! 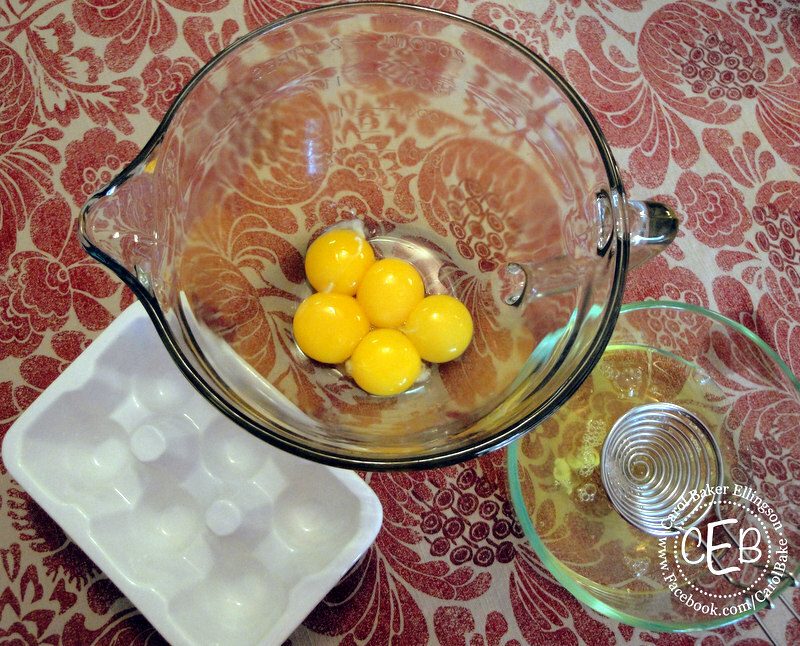 Starting to separate egg yolks. -Now it’s time to make the filling. I found it easier to use a hand mixer on low to mix the ingredients for the filling, but you can also use a whisk if you don’t have a hand mixer. Just get ready to work those biceps! – Gently whisk the yolks together in a bowl; do not let them foam. 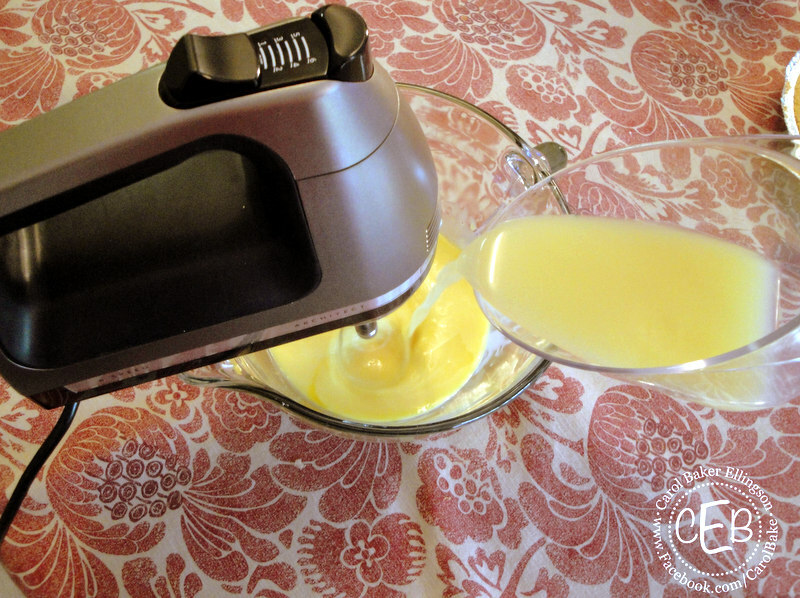 – Stirring constantly, slowly blend in the sweetened condensed milk. 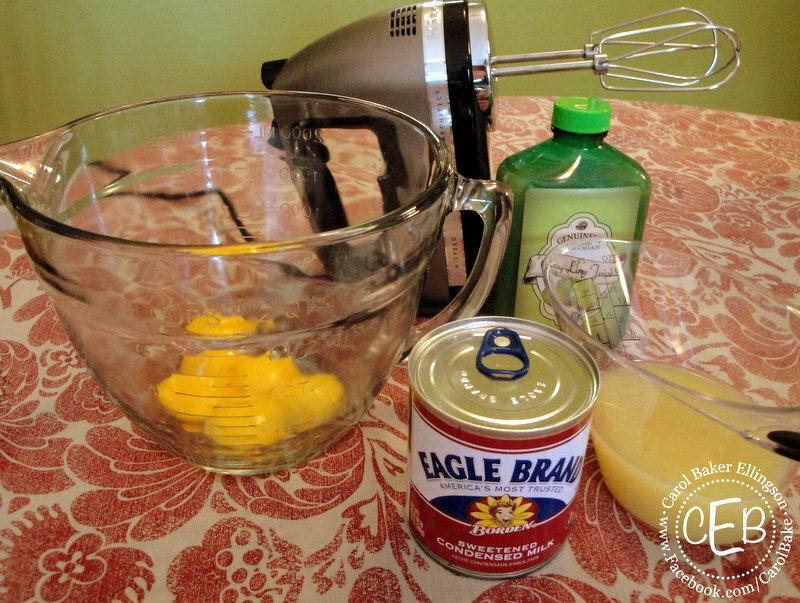 Mixing eggs with sweetened condensed milk. – Keep stirring as you add the Key lime juice. Pouring in key lime juice. 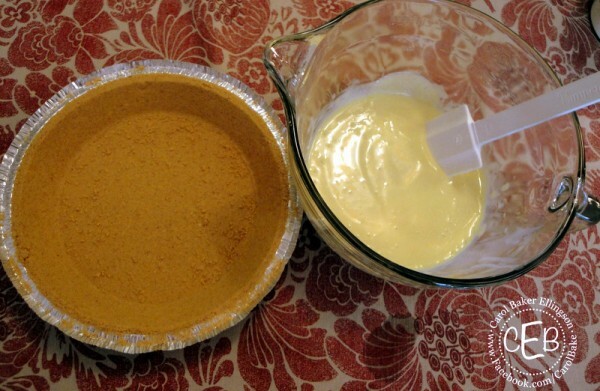 – Pour the mixture into the prepared pie crust. 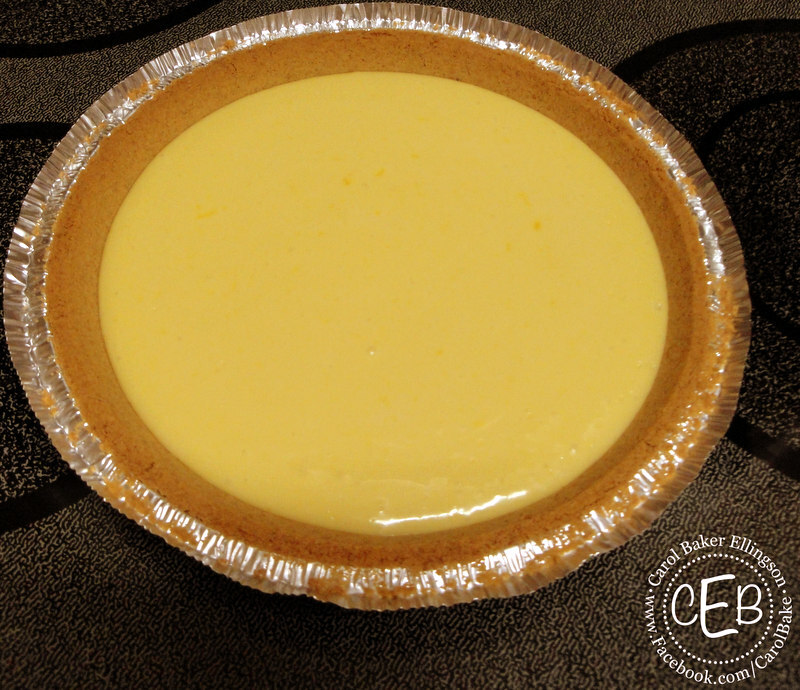 The filling is already super thick and creamy thanks to your egg yolks and sweetened condensed milk! You might want to use a spatula to scrape the bowl…you won’t want to miss an ounce of this pie filling! Filling in mixing bowl next to empty crust. – Bake for 12-15 minutes, or until set. – Remove the pie from the oven. It will look golden and yummy, but it’s not quite ready, yet! Trust me, it’s way worth the wait! – Cool to room temperature on a wire rack. This part is really important! If you don’t let the pie completely cool to room temperature before you refrigerate, your pie will crack! Think of it this way, if you take a burning hot glass dish and throw it under cold water, what will it do? Yep, it will crack. The same thing will happen to your pie if you don’t let it cool before putting it in the fridge. -Chill, covered, until very cold. 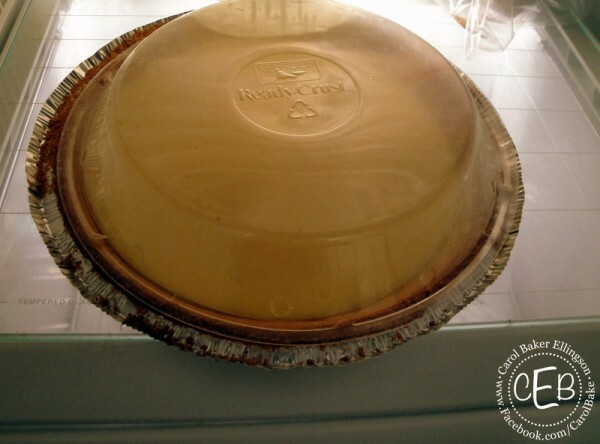 You can use the plastic cover that your pie crust came with to cover for the fridge! Cooked pie -- covered and in fridge. -Serve chilled, cut into wedges. Cut up cute lil pieces of lime and place them on top of the whipped cream for an ooh la la presentation! This is a great dessert to make in bulk! Make 2 or 3 at a time. That way you have a pie for your family, one to win brownie points with the boss at the office, and one to show a friend how much you love them! Or feel free to enjoy them all yourself as you dream about your next trip to Florida. Now it’s time to enjoy a little slice of Florida! You’ve earned it! As with all recipes, you usually find helpful ways to make it easier to make them during the process. 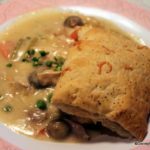 This section is filled with helpful hints that I learned while making this recipe and doing research on some of the ingredients! I hope they help you, too! –Key lime juice can usually be found in the juice aisle of your local grocery store. Look for a plastic bottle of it close to the bottles of lemon and lime juices. -Do not substitute regular lime juice for this recipe. It is not the same thing! You want to make sure you are using Key lime juice! –Make sure you are buying a 9 inch pre-made crust. Keebler has been making a larger crust giving you 2 extra servings. Your filling from this recipe won’t be enough to fill this extra-large crust. If it’s the only thing you can find, no worries, just plan to fill the difference with more whipped cream when you are ready to serve! Check out even more DIY Disney Recipes here! Have you tried the Key Lime Pie at Olivia’s Cafe? If you make this traditional recipe, let us know! « Guest Review: Disney’s Worms & Dirt Cupcake for Earth Day! This is a terrific recipe, and the photo makes me want to try it “tart style.” Do you think a muffin pan would work for this? 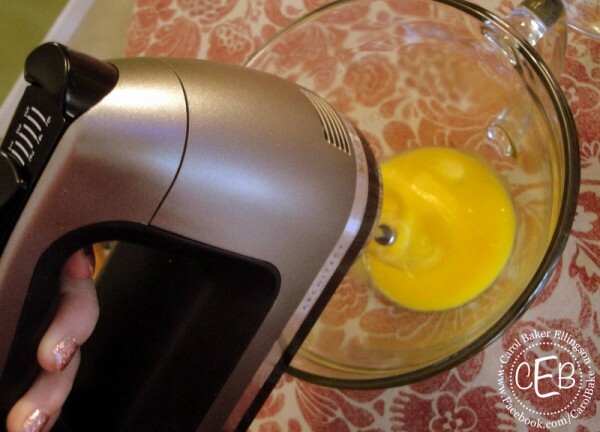 Where did you get your egg separator? I love it. I am a Florida Native too!!! I just love my state, which is why I started my blog and jumping into the blogosphere. It is great to hear from other Natives. I LOVE key lime anything. Thanks for sharing the recipe and your experience. I’m going to make dinner for my brother’s b-day and he doesn’t want a cake, but he likes key lime pie. This is perfect and I can’t wait to make it for him. Thank you so much! Oh yum!!! I wonder, can you find the recipe for the grits served at Goods to Go? 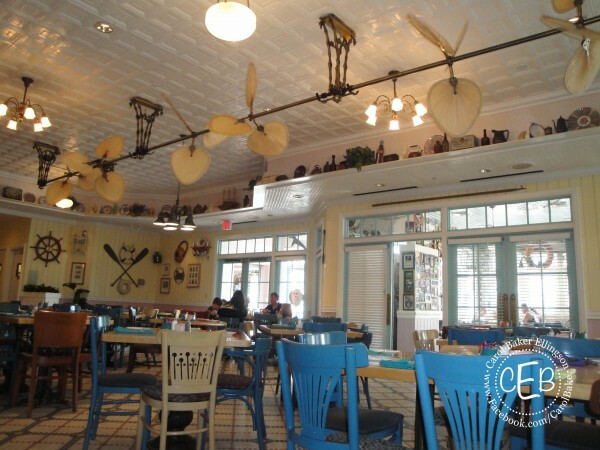 I’m assuming they’re probably the same as the Olivia’s Cafe grits! Olivia- it only takes about 5-10 minutes max to create the filling. Then it will take 12-15 minutes to bake. Let it cool on the counter for about 30 minutes before putting it in the fridge. Then chill for about 3-4 hours. For best results, chill over night. If you are in a hurry, try putting it in the freezer for 45 minutes to an hour. Just make sure you let it cool on the counter for about 30 minutes before chilling, or your filling will crack. 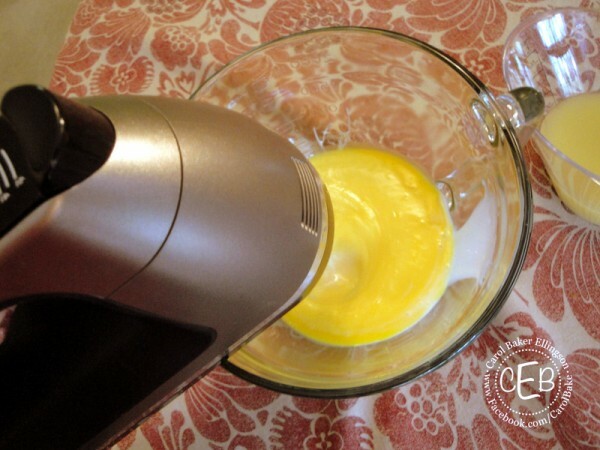 Beth- I LOVE LOVE LOVE my egg separator! It’s from Pampered Chef! Dani- thanks for sharing! It’s nice to meet another Florida native! Let us know how it turns out for you! CanadiansLoveWDW-how did it turn out? What part of Canada are you from? Did you have trouble finding the key lime juice? Essie-Tell him we said happy birthday!!! 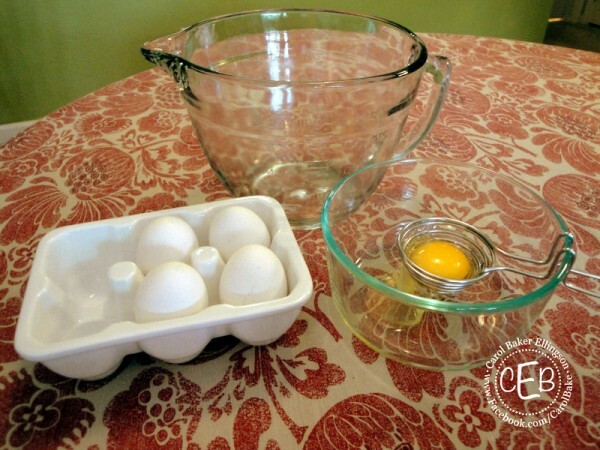 Enjoy this recipe, it’s definitely a favorite! Let us know how it turns out! Add all ingredients to a heavy bottomed sauce pot. Bring to a boil and turn down to a low simmer. Cook very slowly for 45 minutes and stir very often. Key Limes are very thin skinned and hate even a frost. In Tampa, you have to protect them from the cold. The easiest way to grow them — other than going to the Florida Keys (the reason for the Key in the name) — is to get a dwarf, put it in a container you can move, and plan to move the compact tree inside when the weather is cold. And don’t miss this point: Key Lime trees are thorny. If thorns are not your thing, then Key Limes are not for you. When asked to contrast the store (Persian) lime from a Key, I usually mention the Persian lime has few seeds (and can be seedless), grows on a tree without thorns, and produces larger fruit that is easier to use in the kitchen (because of the thick skin and lack of seeds). The Key has a great aroma, is extremely juicy (I usually cut it on a plate so I can slide the juice on the plate into what I am making), and has a unique taste. I have grown both. It is nice to pick a fresh lime when you need one. If I only had room for one plant it would be a Key. The seeds are a mess, and you want to avoid metal strainers for separating out the seeds, but that aroma and flavor is the best. Some people like to put a lemon into the disposal to freshen the aroma. I prefer a Key Lime. 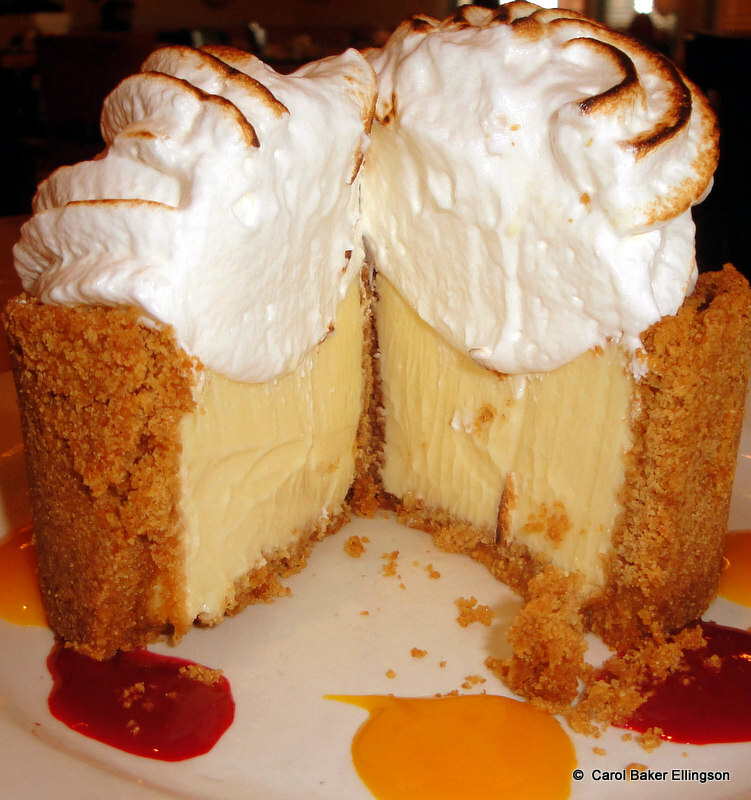 While living in Florida I fell in love with Key Lime Pie. 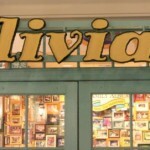 I’m definitely going to try this recipe…maybe even tart style like at Olivia’s Café! Yum! 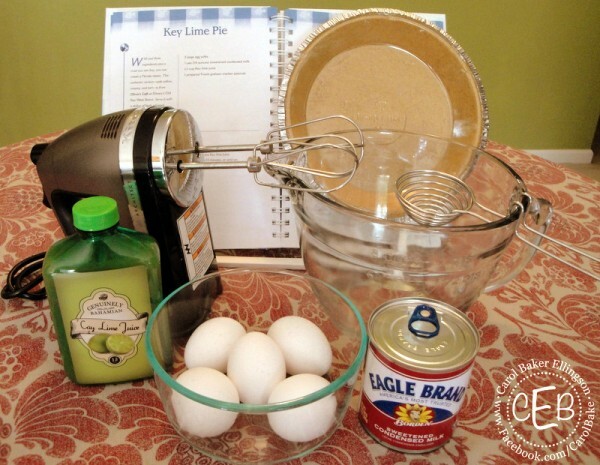 This is a great pie for beginning bakers or those who don’t like to bake. I’ve made dozens of these and they always work out. The recipe is simple and the results are eye and taste bud catching. The tart lime and sweet whipped cream are perfect. 20 minutes to press 4 dozens Key lime, there isn’t much juice in one. It only took 10-15 minutes to make the filling after that. WD- thanks for the info!! Jen-both are fantastic! 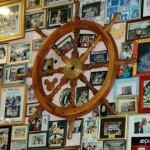 Enjoy making it!! Alan- very true about being a great pie for beginners. 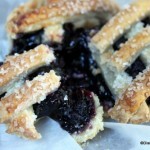 I love making this pie, so easy, but great feedback from everyone who gets to try it!!! Noerdax- I’m so glad you took the time to juice them!!! How did it turn out?? My family prefers the Keebler Shortbread crust to the traditional graham cracker crust. 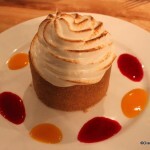 It has a more neutral flavor so the key lime flavor really shines. I also won’t use the canned whipped cream, I make my own whip cream since it’s so easy to do and tastes so much better than the canned stuff for this pie. I followed this recipe and it came out very good! I live in Mexico where all the limes happen to be key limes and squeezed my juice fresh! It was amazing! My fiancée super picky intimidating uncle was pleased! I loved it! I LOVE this recipe. So quick, easy and delicious. AND… a little taste of Disney when I’m at home! 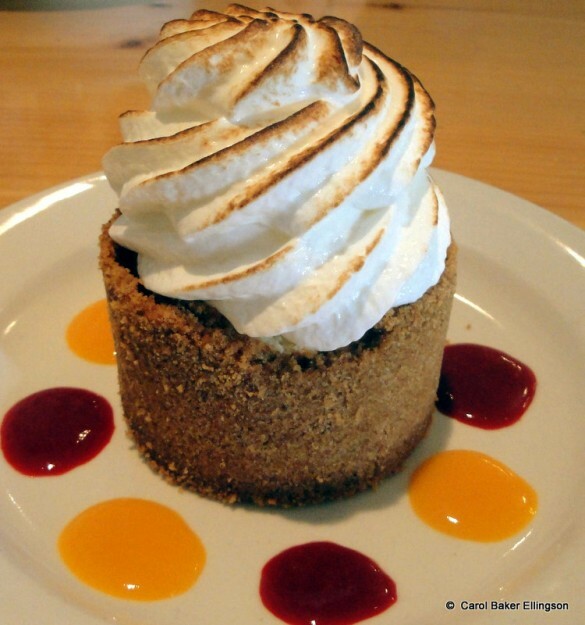 I do love whipped cream on top, but I am curious if anyone has tried to recreate the Olivia’s topping? It tastes like a blend of meringue and marshmallow whip. I experimented with various toppings and my results not comparable to the real thing at the restaurant. I’m all “ears” for others’ suggestions!